After getting an earful from his corner following the ninth round, Bailey (42-7, 37 KOs) picked up the pace in the 10th round and eventually blinded Jones with a jab, then knocked him down with a clean right hand behind it. Jones scrambled to his feet as the round was coming to an end. "I got him real good. I could feel that uppercut in my arm." "I felt really strong and knew going into the fight that I would feel a little nervous, but as I got close to the ring, I built up confidence," Hart said. "When I got in there, I knew he couldn't hurt me no matter what he did. I hurt him right away with a right hand to the body. I was in such a zone. Then I touched his head with a punch and went right back to work." 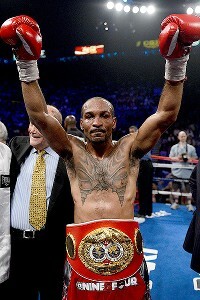 Kevork Djansezian/Getty Images Randall Bailey hung around long enough in a slow-moving fight to land a flush shot and finish Mike Jones in a late knockout.